North Dakota ranks second among the top five states which has the highest number of jobs and site quotients in this profession. It employed 6,980 nursing assistants in May 2013, as per the information provided by the Bureau of Labor Statistics. The yearly and hourly mean salary of a CNA in ND was $28,070 and $13.49, respectively. Employment per thousand jobs was 16.51. As per the data provided by indeed.com, the yearly CNA salary in the state was $22,000 that was 11 percent lower as compared to the average CNA income for job postings all over the nation. 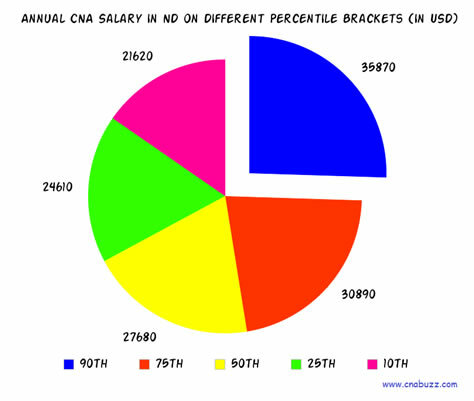 The table shows the CNA salary in North Dakota based on different percentile brackets. 90% of CNAs waged less than $35,870; rest 10% salaried more than $35,870. 75% of certified nurse assistants earned less than $30,890; remaining 25% earned more than $30,890. 50% made less than $27,680; rest 50% earned more than $27,680. 25% of CNAs were paid annual wages less than $24,610; 75% were paid more than $24,610. 10% of employees were offered less than $21,620; 90% were offered more than $21,620. The salary of a certified nursing assistant is calculated after considering numerous factors that includes nurse ranking, level of education, experience in the field, certification level, number of hours worked, nursing specialty, and most importantly geographic location. Dickinson and Minot offered the lowest median annual, monthly, weekly and hourly salary of $21,730, $1,811, $418 and $10 respectively. Fargo and West Fargo paid the highest median yearly salary of $29,091. There are a number of job titles in the nursing sector that involves CNA Float Pool Riverbend, CNA Neurology Riverbend, Correctional Prison Facility CNA, Medical Assistant Family Practice, and many more. They are given responsibilities according to their positions. CNA Hospice was paid the highest among all i.e. $28,000 while Correctional Prison Facility CNA was provided with the lowest amount, i.e. $13,000. According to the Bureau of Labor Statistics, the expected job growth rate for nursing assistants is over 21%. This occupation has outstanding job opportunities throughout the nation due to the development in medical sector. There is high turnover rate in this profession as it’s an entry level job. Hence, CNAs are always in demand as they take advanced program courses in order to become RN or LPN. On the whole, a CNA job strengthens the foundation for a gratifying nursing career. Question 1 – I want to know the salary package of CNAs in Fargo. Answer – In Fargo, the median annual, monthly, weekly and hourly salary of a certified nursing assistant is $29,091, $2,424, $559, and $14 respectively. Question 2 – I will be completing my CNA course after two months. Does anybody know the starting average pay of a CNA in ND? 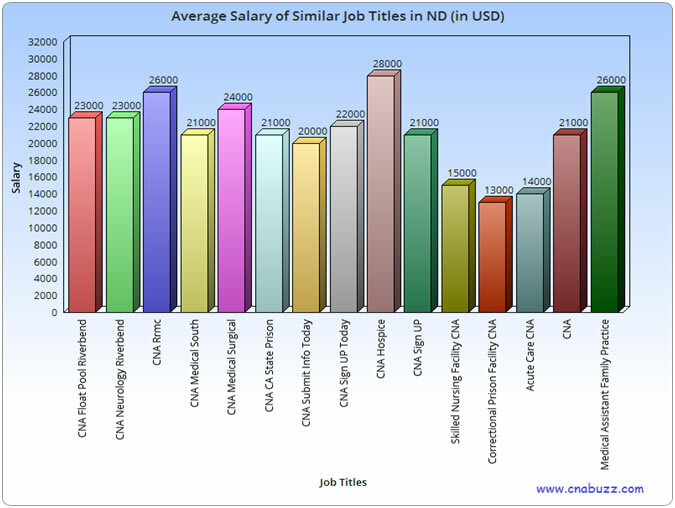 Answer – The average CNA salary in the state of North Dakota was $22,000, as per the data provided by indeed.com, as of January 2015.